Although the concept behind how to do this is straightforward, the implementation - as you'll see from the length of this blog - is a bit messy. This blog is for those using older versions of SSIS and Excel. I've written a newer blog for those using Excel 2010 or later versions. We also offer courses in Excel. You may also have an issue with drivers. For this example, I've deliberately used an old-format Excel file, because I don't have the 64-bit driver for Excel installed on my computer. For more information, see Grasshopper's excellent comments in this article. My holiday ideas for countries in Africa - similar ideas exist for 4 other continents (I've ruled out Antarctica this year, as it's just too cold - plus I don't like penguins). The table will contain holiday ideas for all continents. So much for what we're trying to do. How to go about it? 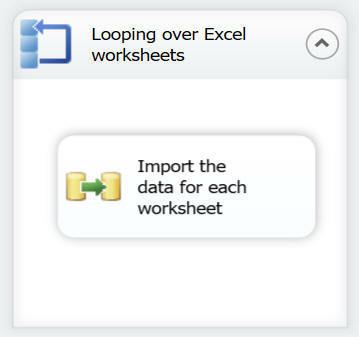 We'll choose to loop over the worksheet names in the Excel workbook. You can think of this as looping over this table of names. We'll accomplish the above using a Foreach ADO.NET Schema Rowset Enumerator loop. You'd normally use this to loop over tables, views or stored procedures in a SQL Server database, but it can also be used - as we'll see - to loop over worksheet names. Set the initial value for the variable to be the name of one of the existing worksheets, followed by a $ sign. 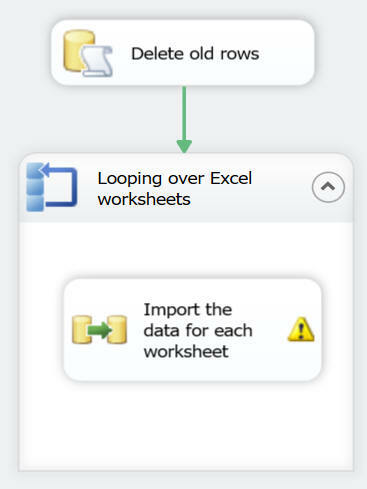 This variable will hold the name of each worksheet, but you must set the initial value to be an existing worksheet name, because otherwise you won't later be able to configure the data flow task to import from this workbook. Add this loop to a new package. Choose the Collection tab, and specify the loop type shown above. Choose to create a new connection. Click at the bottom right of the dialog box which appears to create a new connection manager. Choose this provider from the list, allowing you to link to an Excel workbook. Click on the button shown to find your workbook. Choose to show all files. You can ignore the user name and password - these are only relevant for some Access databases. If you get an error message when you click on this button, either you've done something wrong or you haven't got the right driver installed (see the hint at the top of this blog). This identifies what type of file it is that you're looping over. What this means is that you'll take the 3rd bit of information returned for each worksheet - its name - and store it in the SheetName variable (in SSIS collections are always numbered from 0, not 1). I have no idea what the first and second bit of information returned for a worksheet are, nor can I find anything about this on the Internet. 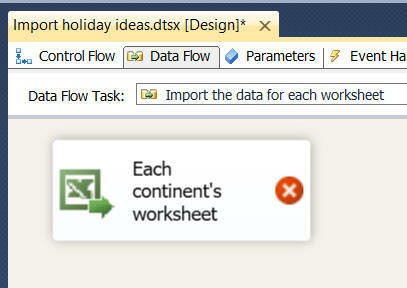 For each worksheet, we'll import the data into our SQL Server table. This should connect to the Holiday Ideas workbook. The red cross is because we haven't said which worksheet we'll use - that's the next step! Because all of the worksheets have the same format, it doesn't matter which one you choose. 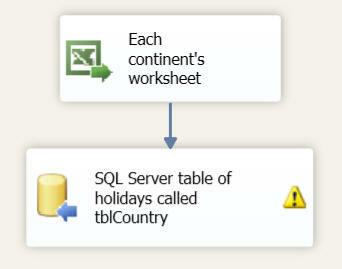 This should connect to your SQL Server database, and specifically to the tblCountry table. I haven't shown how to do this here, but if you're reading this article you should know the basics, I'm hoping. We'll map the two Excel columns into two columns in the SQL Server table. The country id is an identity column whose value will be set automatically. Choose the data access mode as Table name or view name variable, then choose your SheetName variable. The Continent column is, as yet, null. 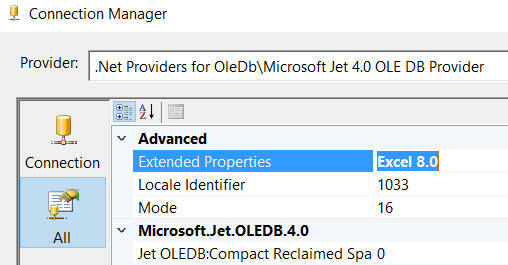 Add an Execute SQL task to delete all the old holidays before importing new ones. Use this statement to delete all of the rows from the tblCountry table. This transform adds a new column, set to equal the name of the current worksheet (as stored in the SheetName variable). 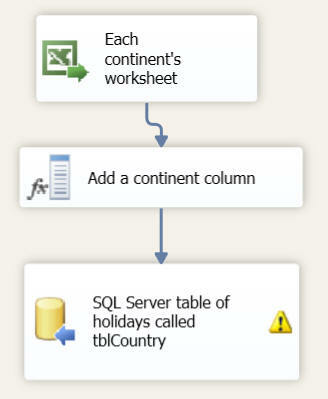 The transform should add a new column (which we may as well call Continent) - the expression for this is shown below. The SheetName variable stores each worksheet name with a $ at the end (Africa$, rather than Africa). This expression takes a substring of the sheet name, beginning at character 1 and ending 1 character before the end. The (DT_WSTR,50) cast is needed to turn the results into a 50 character string, to ensure America doesn't overflow the length of the column. You'll need to add the Continent mapping. Like I said - conceptually not too bad, but messy.